Welcome to Dominion Auto Auction! Located on Lee Highway in Bristol, Virginia, our auctions are open to the public every Tuesday evening at 6:00 PM. Vist the Auctions page for more information. 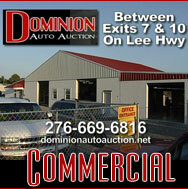 Be sure to check out the About Us page to learn all about Dominion Auto Auction, our services, and facilities. The Contact Us page has all the information needed for getting in touch with us. Auctions every Tuesday Night at 6:00PM ! © Copyright 2019, Dominion Auto Auction, Inc.